MANILA, Philippines - Ailah Antopina, the "Faithful Daughter ng Bacolod," was the second evicted housemate from the Pinoy Big Brother House Friday evening, July 10. “Kid Sunshine ng Cebu” Ryan Bacalla, "Global Gwapito ng UK" Bailey Thomas May, "Daldal Darling ng Australia" Ylona Garcia and "Blossoming Beauty ng Quezon City" Zonia Ysabel Mejia were all saved by public votes. Antopina, 13, got the lowest percentage of votes, 10.38 %. Bacalla, May, Garcia and Mejia received 15.04, 29.28, 21.89, and 23.4 percent of votes respectively. 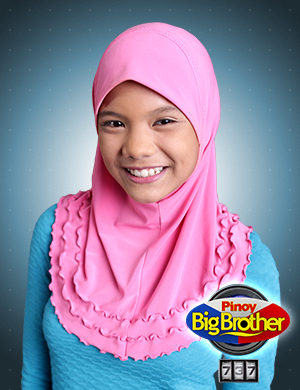 The Muslim housemate revealed before entering 'Kuya's house' that she joined PBB737 in the hopes of making it as a Big Winner so her dad who is currently working in Saudi Arabiacan finally go back home. On Friday, Big Brother also announced that the housemates have hudled on their weekly task of which they must sing Pinoy Ako backwards. As a result, Kenzo and Franco were saved from automatic nomination. 'PBB 737' on Saturday night topped Twitter trending list with '#PBB7372ndEvictionNight' among the most talked-about topics.